At 6.00pm on Friday 18 January, Deliveroo riders in Bristol turned off their apps and refused all orders in the first ever all-out strike to hit the company. The couriers, many of whose wages are currently below subsistence level, were striking for a living wage of £10 per hour or £5 per drop, to include the currently unpaid waiting times at restaurant pick-ups. 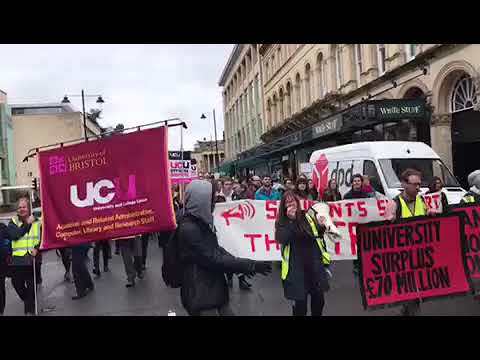 After a short rally on College Green in the city centre, the riders formed a cortege that took to the streets, honking horns and blocking traffic. They proceeded to carry out a series of mini occupations of some of the major customers of Deliveroo in the city – Mission Burrito, Wagamama and KFC. 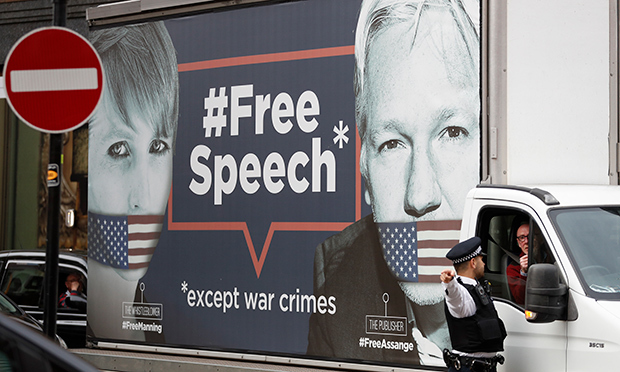 At each restaurant, motorcycle couriers parked on the street outside, flashing lights and blasting horns, while the rest of the demonstrators occupied the establishment in question. 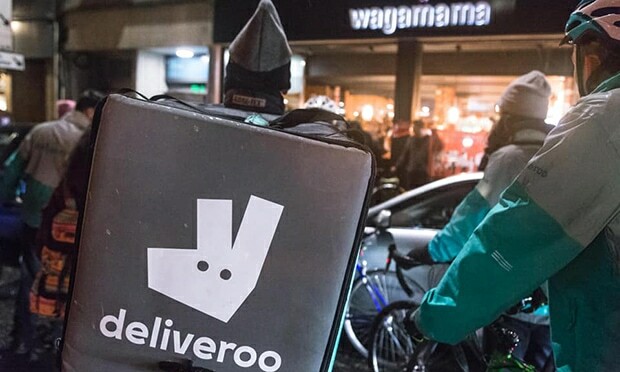 The protestors made it clear that they had no argument with the customers or the workers at each venue, but were there to ask the restaurant managers to put pressure on Deliveroo management and demand that the drivers’ wages should be raised. In each case, they were successful in persuading managers to ring Deliveroo and pass on this message, along with a complaint that they were being put to serious inconvenience as a result of the company’s parsimonious intransigence. 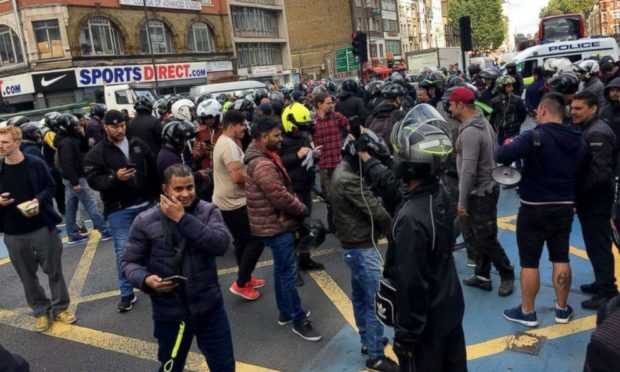 More pressure was put on Deliveroo HQ by the high turnout for the strike, which meant that the company had to refund both customers (for orders not delivered) and restaurants (for being unable to provide the promised service). CPGB-ML members were with the strikers during this spirited action. The text of their leaflet is reproduced below. Although carried out by delivery couriers at a single company and in just one city, the Bristol Deliveroo strike is extremely significant. It follows actions across the fast food industry in 2018 and represents the beginnings of a real fight-back against the insecurity of the zero-hour / gig economy, which is such a driving force in the ongoing impoverishment of British workers. Tech companies like Uber and Deliveroo are carving out monopolies for themselves through the sweat of their workers. In Deliveroo’s case, riders are not only sweated through the imposition of piecework conditions (being paid per drop at an extremely low rate), but actually find that the need to speed up their drop rate forces them to put their lives on the line – driving or cycling recklessly fast in heavy or otherwise dangerous traffic conditions (eg, poor visibility from dark, rain, etc). Bosses and owners are reaping huge rewards through pay packets and bonuses while paying starvation wages and denying any responsibility for their workforce, who have no sick pay, no holiday pay, no pensions, no cover in case of accidents that prevent working, no guaranteed minimum wage – no security of any kind, in fact. This is the capitalists’ dream scenario: a totally dispensable and replaceable workforce with no rights and no comeback against any action the company might choose to take. No wonder Deliveroo has fought tooth and nail to prevent workers challenging the legal fiction of ‘self-employment’. The company’s bosses hide behind this convenient lie, promoting the myths of ‘flexibility’ and ‘control’ in their job advertisements while pushing down pay every chance they get. When rival Take Eat Easy went out of business in 2016, for example, UberEats and Deliveroo were quick to take advantage of their consolidated position as the main employers of riders to push down rates of pay. Similarly, both companies have made a point of building up an overlarge pool of riders in order to create maximum competition among workers for every job, thus pitting worker against worker in the interests of keeping drop rates as low as possible. Further downward pressure on wages can be expected if the planned takeover of Deliveroo by UberEats, currently at the negotiating stage, actually goes ahead. Bristol’s Deliveroo riders have drawn the correct conclusion from all this: that the only reply to the relentless onslaughts of organised capital is an organised workforce. As workers, our only real weapon is our collective strength; our only chance of successfully winning concessions from the capitalists (or of removing them altogether) is through unity of action. 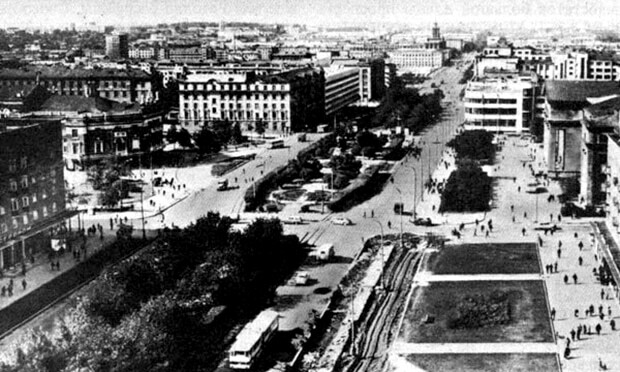 When the postwar overproduction crisis started to bite in Britain from the mid-1970s onwards, any union with an even moderately class-conscious leadership that was prepared to face down the bosses and take militant action in defence of its members’ jobs, pay and conditions was systematically attacked, as a precursor to wiping out the jobs of its members – the steel and coal unions, the dockers, car workers and print workers, to name just a few. The unions that remain have (with the odd honourable exception) been utterly cowed, giving up for the most part even the pretence of fighting back, confining themselves to negotiating redundancy packages and encouraging their members to pin their hopes for salvation on the election of a left-Labour government – a mirage brought tantalisingly and unexpectedly close by the advent of Jeremy Corbyn to the leadership of Britain’s second imperialist party. 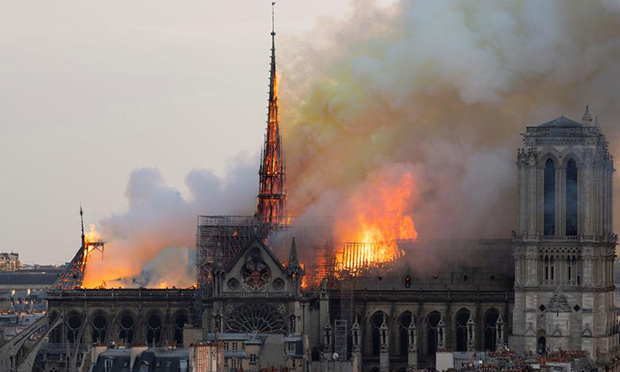 This systematic destruction of workers’ organisations was no accident. The lack of meaningful leadership for workers, which allowed successive governments (on behalf of their capitalist masters) to chip away steadily at workers’ rights, has led us inexorably to the situation we face today, where so many workers have no security, no rights and no representation or organisation at work. It is no coincidence that companies like Amazon and Deliveroo, with large workforces enduring stressful conditions on poverty pay, should be working so hard to deny their workers the right to trade-union representation. 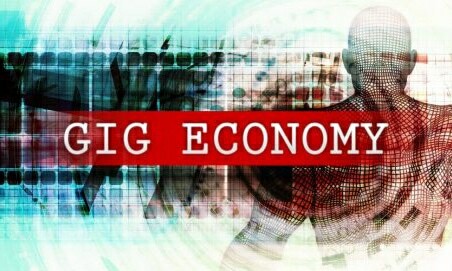 If the working class is to get up off its knees, there will have to be a fight-back, and it is not at all surprising to see the beginnings of that struggle in arenas like the outsourced cleaning companies and the fast food industry, where Britain’s poorest workers have for so long endured high levels of insecurity, unliveable pay and inhuman conditions. 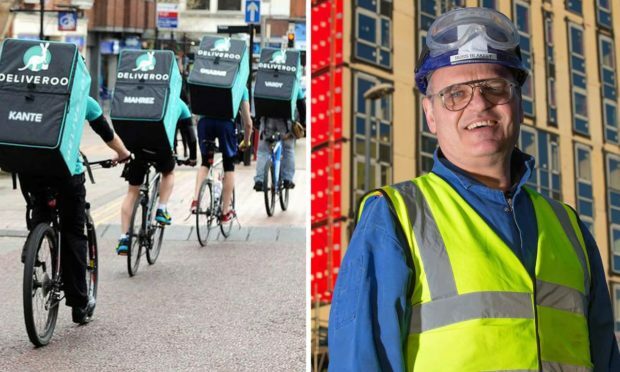 The Bristol Deliveroo drivers’ demands for a living wage and collective bargaining rights are hardly outrageous ones – they are, in fact, recognised by the United Nations as inalienable human rights. If the capitalists can’t manage to pay decent wages out of their obscene profits, it is clear they are not fit to be in charge. Deliveroo bosses’ behaviour is a stark reminder of the fact that workers don’t get anything by asking nicely. Capitalism isn’t reasonable; it makes its profits at the expense of the workers. If we want to secure a decent life for ourselves and our families, we have to recognise that our interests are entirely opposed to those of our rulers. The CPGB-ML stands in solidarity with all those who are fighting back against poverty pay and union-busting bosses. In the battle between the workers and the capitalists, we stand for the workers. 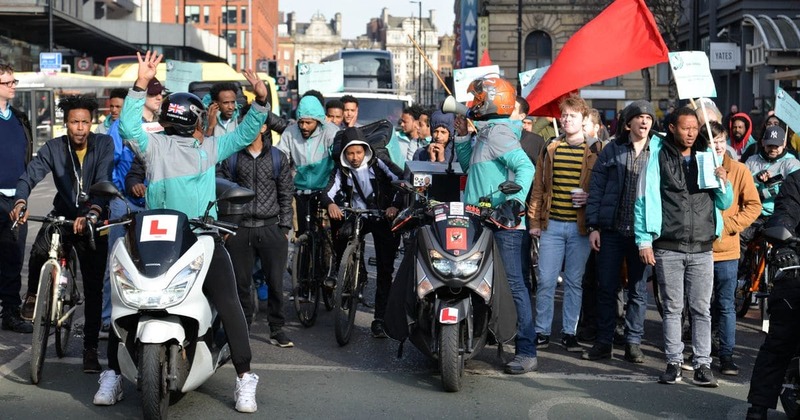 Following a series of actions in 2018 against poverty pay and bosses’ union-busting, Deliveroo workers in Bristol have called an all-out strike for the evening of Friday 18 January. Their demands are simple: a living wage and union recognition so they can negotiate collectively with their employers. 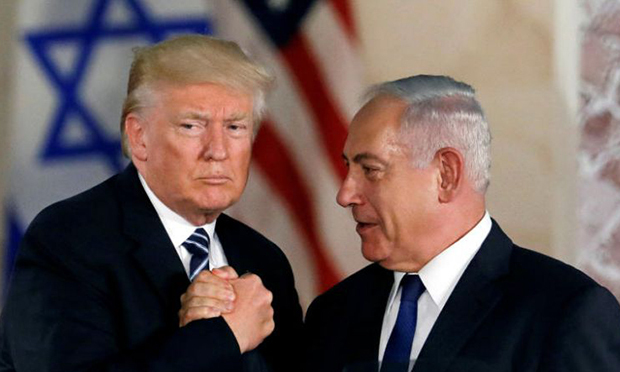 This is not an isolated dispute. Fast food workers and riders across the world are demanding better pay and better conditions after years of uncertain hours, dangerous conditions and bullying – all for the lowest wage possible. Tech giants like Uber and Deliveroo are building monopolies and reaping huge dividends on the backs of their workers. Couriers work in a demanding and unrewarding industry. Exhaustion, bullying, injuries while working and insecure hours are commonplace. Owing to the unstable nature of the gig economy, riders are never sure when they will get work or how much money they will make. They are often forced to make deliveries as fast as possible, putting them in dangerous situations on the roads. They are also made to wait for long unpaid periods at restaurants when picking up orders, leading to severe hardship and an hourly rate that is well below minimum wage. There is a constant narrative driven by employers and the media that these are only ‘starter’ or part-time jobs, just for teenagers or people who need a bit of extra cash, and that therefore workers should not expect decent pay or conditions, but this is nonsense! It is entirely within the means of any business to provide a living wage for its staff. Deliveroo certainly can. The company doubled its revenue last year and is now worth £1bn. It routinely pays out millions in bonuses to its executives, but the riders who have sweated to make them all this money face only pay cuts and insecurity. Deliveroo refuses to accept that it is the riders’ employer, preferring to hide behind the gig economy lie of ‘flexible self-employment’. But for many of its riders, these jobs are the only ones available, and they find themselves working intolerable hours to try to make ends meet and support their families. Workers who organise to fight back and improve their lot often face criticism from people who should be supporting them. Capitalist propaganda tells us that strikers are just greedy and are already paid too much, pitting worker against fellow worker. But in reality, all workers ultimately have the same interests, and a victory for one group is a victory for us all. Regardless of age or the reason for working, everyone should be guaranteed a job, and everyone should be guaranteed a living wage as a human right. If we allow the capitalists to enforce bad conditions on one set of workers today, tomorrow they will be coming for us. Organisation is a vital weapon in the fight for our rights. It is only when workers act together that they can stand up for themselves and win better pay, rights and dignity at work. The bosses may not like it, and the government and media will attack us, but the reality is that we make, mend and run everything in society. Individually we are powerless; together we are a force!